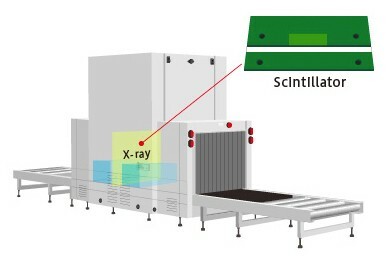 Scintillators are materials that emit light when they come into contact with radiation such as X-rays and gamma rays. Ceramic type GOS scintillators are used for purposes such as CT scanners, security devices and non-destructive testing. 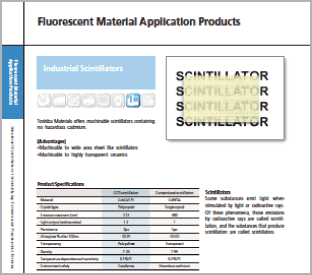 Toshiba Materials develops and manufactures scintillators with a high sensitivity and low afterglow, using two of our specialties: fine ceramics manufacturing technology and fluorescent material design technology. 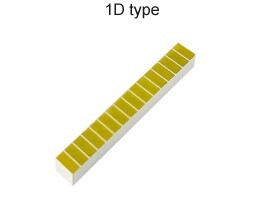 High sensitivity and low afterglow due to short persistence. * The values above are reference values, and are not guaranteed. 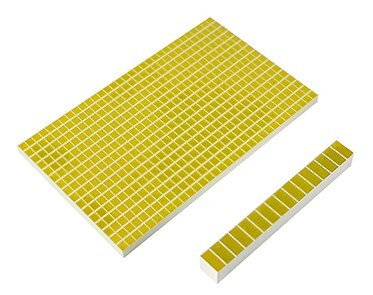 The actual values may differ depending on the measurement method. * Comparison of 2mm-thick scintillators, * Measurements conducted by Toshiba Materials, * Light output is relative to cadmium tungstate. GOS1: Suited to non-destructive testing. 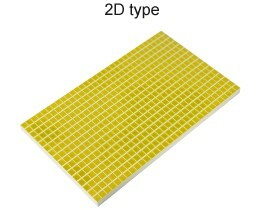 GOS2: Ideal for products in which a low afterglow is important, such as high-speed scanning devices. Contact us for more details on purposes, materials, etc.